What I'm Wearing: Gap Blazer, H&M Tank Top, Monki Silk Trousers, New Look Neon Diamante Necklace, Russell & Bromley Tasselled Loafers & Alexander McQueen Twin Skull Ring. Let the sunshine. 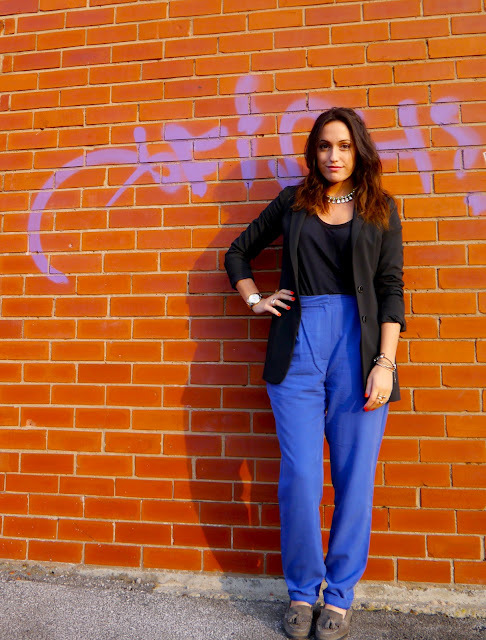 There were blue skies all around today, so a perfect opportunity to whip out my new blue trousers from Monki. So soft and silky, the perfect pair to wear for a full days work in the studio. Monki is such a fun and playful brand - hence the jacket twirling & leaping and bounding around the place - selling the perfect wardrobe staples and gorgeous accessories all with a slightly quirky and unique twist (for all you Londoner's be sure to check out their store on Carnaby St). Emma and I had such fun taking these snaps, despite getting some seriously weird looks from the passersby (check out some of the outtakes on instagram #supercalafashionistic). Toiling and pattern cutting all day with the fashion design girlies really took it out of me today, but a free manicure in the union was the perfect reward for all our hard work. Finally getting a well deserved early night tonight, Wahoo! And I mustn't forget to say a big thanks to the lovely Emma for her wonderful photography skills.